1. Cut butter into 3/4-inch pieces and place in freezer for 15 minutes. Mix flour, salt, and sugar in a food processor fitted with the steel blade. Place the Crisco in 1-tablespoon lumps into the food processor along with the frozen butter pieces. Pulse about 8 times (1-second pulses) or until the dough appears slightly yellow and pebbly in texture and the butter is reduced to very small pieces, the size of tiny peas or smaller. Turn mixture into a medium bowl. 2. Sprinkle with 3 tablespoons of ice water over the mixture. With the blade of a large rubber spatula, use a folding motion to mix, then press down on dough with the broad side of the spatula until the dough sticks together, adding up to 4 tablespoons more water if dough will not come together. Work slowly, mixing the dough to evenly distribute the water. The dough should be very wet and sticky at this point. Shape dough into a ball with your hands, turn onto a lightly floured surface, and flatten into a 4-inch-wide disk. Dust very lightly with flour, wrap in plastic, and refrigerate for at least 30 minutes before rolling. 3. If dough has spent more than an hour in the refrigerator, let warm up a few minutes on the counter before proceeding. Roll out dough and place into an 8- or 9-inch pie pan. Push down gently down the sides of the pan. Trim dough around edge of pan, leaving a 1/2inch border. Fold excess dough underneath the edge of the dough and shape edge using fingers or press with the tines of a fork. Place in refrigerator for at least 40 minutes. Place in freezer for 20 minutes. Heat oven to 375 degrees. 4. Remove pie shell from freezer and fit a double thickness of heavy-duty aluminum foil over shell, fitting foil carefully into bottom of pie shell and pressing against the sides. Add pie weights or dried beans, enough to generously cover bottom of pie plate. Pile up the weights around the sides of the shell to help hold them in place. 5. Bake on lower rack for about 21 minutes, or until sides of pie shell are set. (They should not be moist and should be firm.) Remove foil and weights and bake another 4 minutes. Remove pie shell from oven and increase oven temperature to 425 degrees. Meanwhile, combine the sugar, molasses, salt, ginger, cinnamon, cloves, pumpkin and evaporated milk in a medium saucepan over low heat and whisk occasionally, until bubbling. In a separate bowl, crack the eggs and whisk together. Once the mixture is bubbling, add roughly 1/2 cup of the hot liquid into the bowl of eggs to temper them. Whisk together the eggs and mixture in the small bowl and then transfer back into saucepan and combine all together. 6. Pour the hot filling into the still-hot prebaked pie shell and place on a baking sheet in the oven. Bake for 10 minutes and then lower heat to 350 degrees. 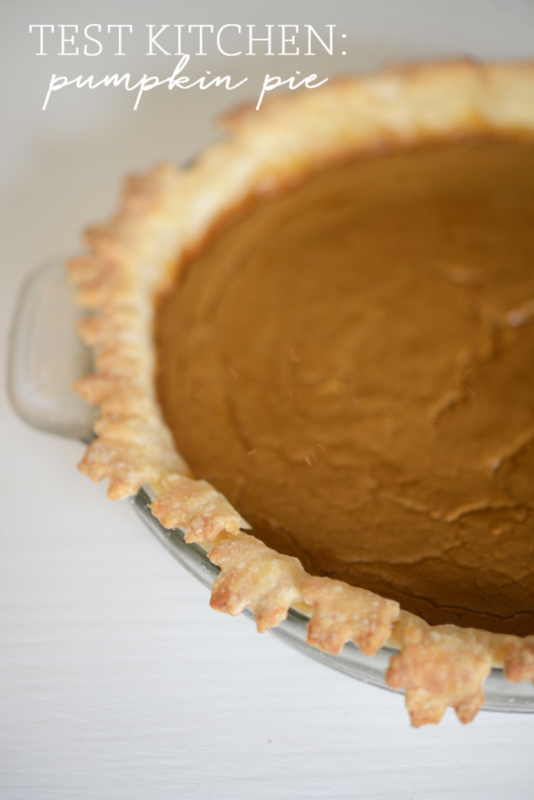 Turn pie around so that filling bakes evenly. If the crust starts to become too brown, cover it with strips of aluminum foil. Bake 10 to 15 minutes longer, but start checking the pie after 8 minutes and every minute thereafter. Check by jiggling pie slightly. The mixture will puff up slightly but it should still shimmy and shake a bit when jiggled. This is the time to remove the pie from the oven. Remove from oven and let cool on a rack for at least 1 hour before serving. Serve with sweetened whipped cream or vanilla ice cream.